I can neither sing nor paint. Yet I regard myself as S.Rajam's disciple, as I sincerely hope to follow his bani of living life (Raja Margam). I met Rajam sir on a Vijayadasami day in 2006, when I interviewed him for my GNB book. Despite poor health, he gave me a detailed interview. He was painting a Saptamata series then. When I pointed out that his depiction was significantly different from the early Chola sculptures, his eyes lit up. An ardent admirer of Chola and Pallava art, he couldn't wait to see the photographs of those sculptures. From then on, my visits to Chennai were never complete without a session with Rajam sir. Rajam sir had the rare ability of objectively analysing music. He did not let the person behind the music influence his analysis. His accounts of the likes of Ambi Dikshitar, Papanasam Sivan, and Madurai Mani were a real treat. It was as if he was living those moments again. Every time I asked him about his experience of learning from Mylapore Gowri Amma, he sang "Tiruvotriyur Tyagarajan" and "Ettanai sonnalum". The way he mimicked Gowri Ammal’s abhinayam is unforgettable. I have watched him teach from close quarters. Each session was a peek into his creativity, as he would spontaneously unfold sangati after sangati even in the rarest of the kritis. I had the good fortune of seeing the Saptaswara paintings bloom from the details mentioned in the 'Sangita Kalpadrumam' of Muthiah Bhagavatar. To watch the way Rajam sir went about his research and the layers he created literally and figuratively to depict all the details was a once-in-a-lifetime experience. We would discuss something in a very casual way and the next time I visited him, Rajam sir would have painted something based on our conversation. Once I asked him if the similes mentioned in kritis were realistic. 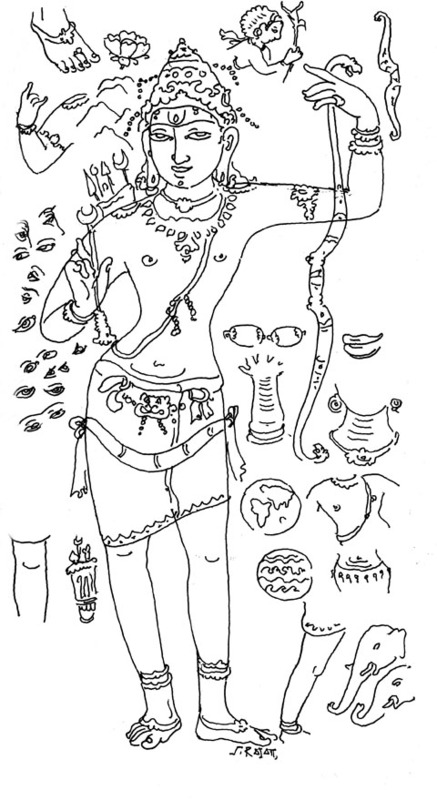 Rajam sir responded with an extempore line drawing of the kriti "Anta Rama soundaryam" (See Illustration), depicting the various similes and their correlation to an attribute of Rama. For the past six months, I have been involved in making a documentary on Rajam sir. Despite his difficulty in moving about, Rajam sir gave me the utmost cooperation and often suggested frames and lighting during the shoot. He also created some paintings exclusively for the documentary. Our crew and I were shattered when we realized that Rajam sir wouldn’t be around when we screen the documentary. A few months ago, at 91, Rajam sir wanted to paint all the 108 karanas. He also said, "I painted the trinity long ago and the painting has become famous. Only a few days ago, I realised that I hadn’t painted the Tamil Isai trinity". He wanted me to look out for details on Marimutha Pillai. He also wanted to depict the entire Soundarya Lahari through his paintings. I’m sure he had much more in his 'to-do’ list. The last wish he expressed to me when I recently met him at Isabel Hospital was to celebrate 'Kotiswara Iyer day’ annually. I hope his disciples will fulfil this wish. While I cherish the many wonderful moments I had with Rajam sir, the very thought that he won’t be around when I visit Chennai next is difficult to deal with.